Fabric: The Regatta Dover jacket uses their Regatta hydrafort fabric. It is both waterproof and windproof, providing reliable protection from the elements whilst reducing the production of body heat, making it perfect for outdoor activities. 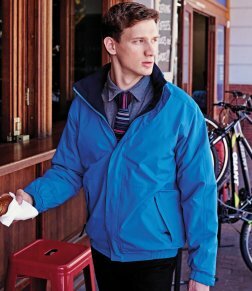 Waterproof: The Regatta Dover jacket is waterproof to a hydrostatic head of 5000mm (4x British standard BS3424). It’s got taped seams, Elasticated adjustable cuffs, Storm flap protected front zip & pockets as well as an integrated, fold away hood. Warmth: The Regatta Dover Jacket uses their symmetry fleece fabric. It is comfortable and practical to wear, it has an anti-pill finish making it durable and long lasting abd it is quick drying. The Thermoguard insulation technology is made up of synthetic fibres which trap the air keeping you warm in cold conditions. Size Range: Available in adult sizes from xxa (34″ chest) up to 4xl (52/54″ chest) as well as a complementary childrens wear range. Colours: Currently available in 8 different colour ranges. So there it is! Price, Waterproofing, warmth and a great colour & size range, That’s why we recommend it. Please note this a Regatta Professional product, and as such is unbranded. This entry was posted in Jackets on 7th February 2017 by admin.